Westcott Spiderlite TD5 Fluorescent lighting reviews for digital photography studios | Digital Photography. Fluorescent lighting for digital photography studios: Westcott Spiderlite TD5. 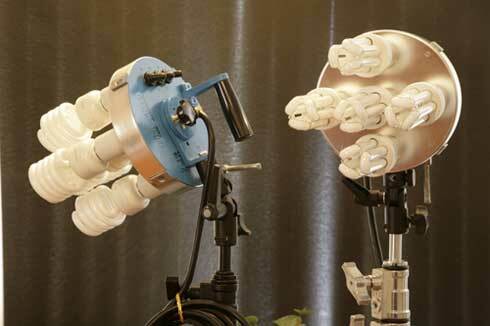 This innovative Westcott Spiderlite TD5 fixture can be used with fluorescent lamps at 5500 degrees Kelvin or Halogen lamps at 3200 Kelvin (the color temperature of tungsten lamps). You can find a Westcott display and the friendly Westcott team at photography expos such as PhotoPlus Expo, each autumn in New York. FLAAR uses fluorescent lights due to their lack of heat. Most museums don’t allow hot lights (tungsten lamps go up to 1000 watts and over). The Halogen lamp alternative for the Westcott Spiderlite TD5 series is 150 watts, so nowhere near the heat of a traditional 1000 watt bulb. FLAAR photographs pre-Columbian art as well as plants and animals that are associated with pre-Columbian Mayan archaeology, iconography, epigraphy, and religion. So we need cool lamps. But you can also use these Westcott Spiderlite TD5 fluorescent lights for portrait lighting, product photography lighting, etc. FLAAR Reports provide tips, help, information, and reviews of the equipment used. The F. J. Westcott company is in Toledo, which was our neighbor to the north during the five years FLAAR when founded and was in charge of the digital imaging equipment evaluation facility at BGSU (Bowling Green State University). 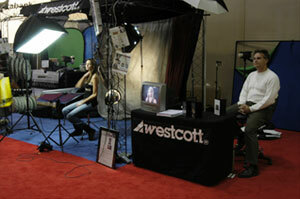 In addition to lighting, the FJWestcott web site also has seminars and training programs, so check out their website. Remember how to spell Westcott, and add the FJ in front: www.fjwestcott.com. We do not yet have the Westcott TD3 Spiderlites so can't yet evaluate their performance in the field. Whereas the TD5 Spiderlites have 5 lamps, the TD3 have three, hence they can be battery powered for a reasonable time period. But today, in 2016, we would suggest the newer uLite from Westcott as an alternative to the TD3. The TD5 can also be used in the field with batteries, just you need a larger battery unit. We used Westcott TD5 in remote areas of Guatemala to photograph achiote and achiote flowers (this is a local seasoning for cacao (cocoa, chocolate)). Here you can see the photography of botanical specimens in the FLAAR photo studio in Guatemala. This digital photography is part of our long range projects to study Mayan ethnobotany. 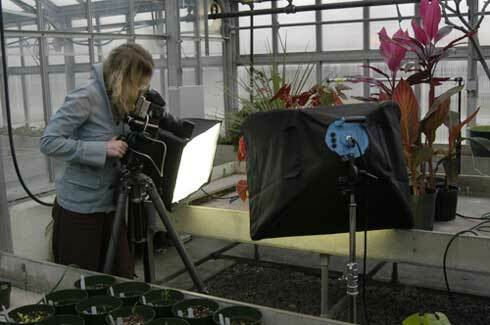 One of the FLAAR student interns is using Westcott TD5 Spiderlites to photograph botanical specimens in the greenhouse at BGSU in Ohio. These lamps are still functioning after 7 years. We use them every week. Nicholas Hellmuth at La Ruta Maya Foundation, Guatemala, taking pictures of Maya vases to make them accessible to students and the public in general. When you click on this photo to enlarge it, you can see that we have both tungsten halogen lighting (Lowel Lights, at the left and middle) and Westcott Spiderlights, at the right. And yes, we have three different cameras, since each kind of camera has different capabilities: the one at the left is a digital rollout camera (the only one in Latin America that we know of). This is a 'Photokina year' meaning there is a Photokina photography equipment expo in Cologne, Germany this autumn. The photography equipment evaluation review editors of FLAAR Reports attend every Photokina. But frankly there is no need to wait until autumn. 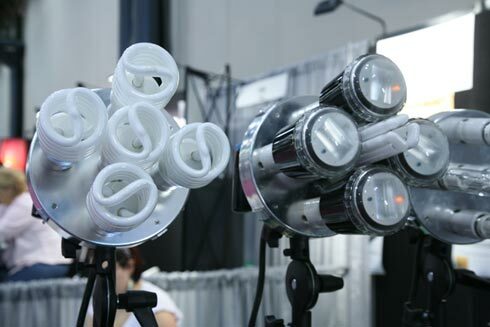 Since we have many decades experience with lighting for photo studios, we can suggest a list now, already in January. We will be looking to evaluate a set of four TD6 units with small softbox in front and two uLite units with 6' reflectors. Most recently updated January 26, 2016. Previously recently updated Jan. 14, 2013 (we have been pleased with Westcott lighting for five years now). First posted January 14, 2008, and updated with PDFs several times since then.